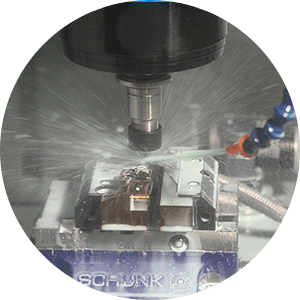 Unity offers state-of-the-art CNC milling machine services including 4th and 5th axis capabilities. We use automated robot machinery that are able to keep working long past normal working hours. With 24/7 capabilities, high volume projects can be completed faster and be delivered within tighter time frames. • 10 Haas VF-2 SS: Table 14”x36”, Travel-X 30”, Y 16”, Z 20”, 24+1 Tool Auto Tool Changer, 12,000 RPM Spindle, Thru spindle coolant, Automatic tool and part probe systems. 4th axis capable. • 2 Haas VF-3 SS: Table 14”x36”, Travel-X 40”, Y 20”, Z 25”, 24+1 Tool Auto Tool Changer, 12,000 RPM Spindle, Thru spindle coolant, Automatic tool and part probe systems. 5th axis capable. • 2 Haas TR160: 5 axis trunnion table. • 4 Haas DT-1 w/ Fanuc robot loader: Table 15”x26”, Travel-X 20”, Y 16”, Z 15.5”, 24+1 Tool Auto Tool Changer, 12,000 RPM Spindle, Thru spindle coolant, Automatic tool and part probe systems. • 3 Haas HRT210 Rotary Table: Full 4th Axis, 10”dia. Capacity, 16C collet capacity, 1 5/8” diameter thru. • 2 Haas SWA5CB: 4th axis rotary, 5C collet capacity. Getting started with our CNC milling services is easy, simply give us a call at 763-428-9888 or request a quote.